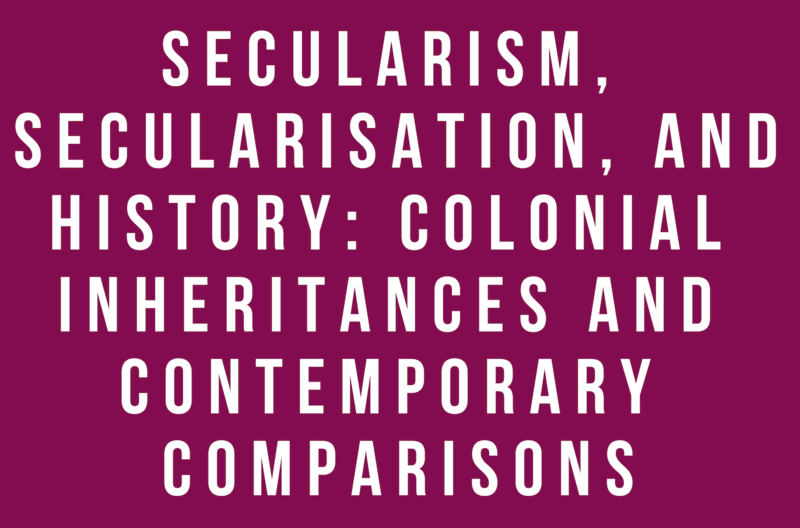 Join us for a panel discussion on the topic of ‘Secularism, Secularisation, and History: Colonial Inheritances and Contemporary Comparisons’. Neilesh Bose (University of Victoria) will review recent scholarship on secularism and secularisation in South Asia, as well as turn to history, especially colonial history, to offer a preview of his current book in progress, which aims to add to the debates on secularism in the contemporary by historicizing how South Asians have imagined, defined and compared religions in the modern past. Dina M. Siddiqi, NYU, and Saadia Toor, College of Staten Island, CUNY, will respond, paying particular attention to questions of religious minorities and secularism in comparative and contemporary contexts. Dr. Bose’s research and teaching interests include the history of modern South Asia (the Indian subcontinent), the British Empire, decolonization, and the history of diasporas and migrations. He also holds an interest in theater, performance studies, and popular culture. His first book examined the intersections between linguistic identity and Muslim religious community formation in late colonial Bengal, and his current project explores the history of religious reform in colonial India and ways that Indian religious reformers studied local religious practices in the service of a broader universalism. Dr. Bose earned his PhD in South Asian history at Tufts University in 2009 and has taught at the University of North Texas in Denton, TX, and St. John’s University in Queens, NY, before joining the University of Victoria in 2015 as Tier II Canada Research Chair in Global and Comparative History. Professor Siddiqi’s research and publications cover a range of issues grounded in the study of gender and Islam in Bangladesh: transnational feminist politics, women’s work in the ready-made garment industry, the anthropology of human rights, gender justice, and non-state dispute resolution mechanisms. She is a Fellow at the Center for the Study of Social Difference (CSSD), Columbia University where she is affiliated with a three-year project on Religion and the Global Framing of Gender Violence. She serves on the editorial board of Dialectical Anthropology and Routledge’s Women in Asia Publication Series. Dr. Saadia Toor’s scholarship revolves around issues of culture, nationalism, gender/sexuality, state formation, and international political economy. Her book, The State of Islam: Culture and Cold War Politics in Pakistan was published by Pluto Press in 2011. A special issue of Women’s Studies Quarterly on the theme of Solidarity co-edited by Dr. Toor was published in November 2014.